Randy's Donuts is one of six giant donuts in the Los Angeles area. If you're a fan of donuts, then Los Angeles is where you want to be. 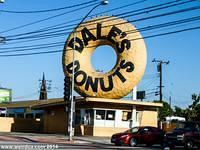 There are as many as ten giant donuts (one is now a "bagel") spread throughout the greater Los Angeles area. 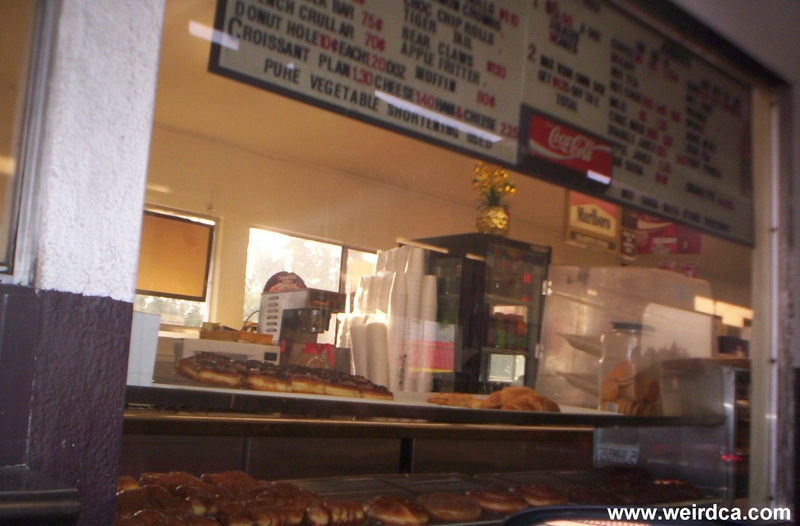 Five are part of the original Big Donut Drive-In chain, four are formerly of the Mrs. Chapman's Angel Food Donuts Chain, and the last is an independent donut shop called The Donut Hole. 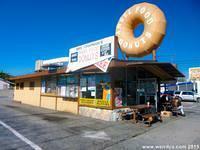 The most famous and iconic of the giant donuts in Los Angeles is Randy's Donuts. It has appeared in multiple movies such as Mars Attacks, 2012, Iron Man 2, Earth Girls are Easy, and Volcano; TV series such as Californication and The Simpsons; and even music videos (Red Hot Chili Peppers' "Californication" and Randy Newman's "I Love LA"). 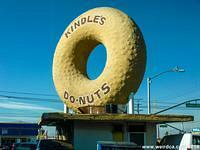 But it's not the only giant donut residing in the Los Angeles area. It's actually not even the only giant donut of its type. It was originally built in 1953, the second location of a chain of ten donut stands called Big Donut Drive-In, five of which still remain. 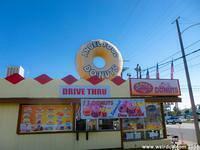 The Big Donut Drive In was originally owned by Russell C. Wendell, a doughnut machine salesman. The building was designed by Henry J. Goodwin. 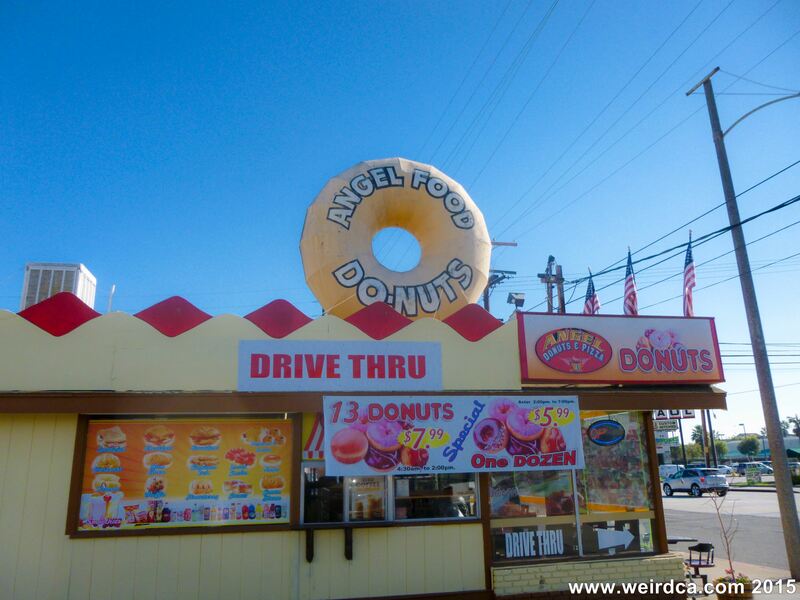 However, The Big Donut Drive In chain is no longer around, Wendell having sold off the giant donuts one by one back in the seventies in order to focus on his taco restaurants (themselves later sold to Taco Bell in 1984). 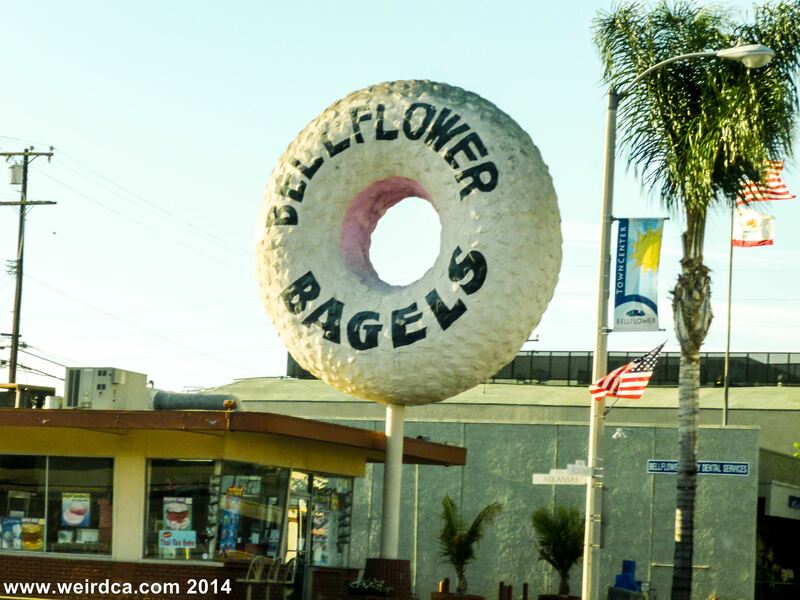 Five of the original ten remain; four featuring giant 32 plus foot concrete donuts on their roofs, and one, in Bellflower, featuring a smaller 23 foot one. 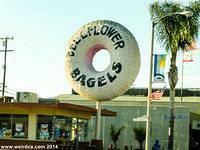 The Bellflower one has been re-purposed and is now a bagel. 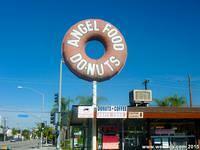 None are as popular as Randy's Donuts, perhaps because of its proximity to the Los Angeles airport. Its location allows people to take iconic pictures with airplanes behind the giant donut. Besides Randy's in Inglewood and Bellflower Bagel, three other locations from the chain survive. There is also Dale's Donuts in Compton, Donut King II in Gardena, and the original first donut, Kindle's Giant Donut on Normandie in Los Angeles. 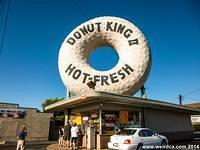 However, there stands in La Puente a donut even larger. Not wanting to be out done by the 32 foot in diameter donut of the Big Donut Drive-In, some time in 1958 (although dates conflict with some mentioning as early as 1947 and some as late as 1963 and even 1968), a drive thru donut shop opened that was not just one giant donut, but two gigantic donuts with a small building in between. Customers drive through both giant pastries on their way to get delicious donuts. The donut shop became part of the Donut Hole chain in 1968. 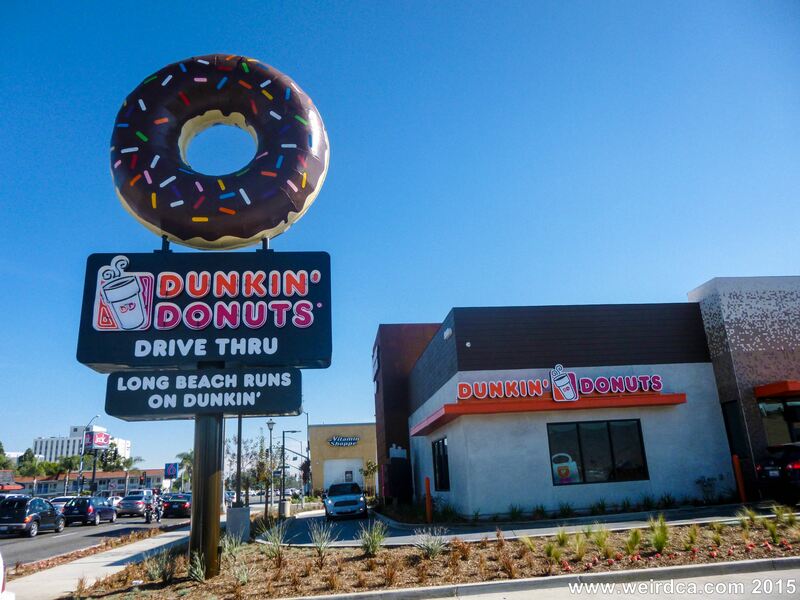 The chain had five locations (including the La Puente one), but only the one in La Puente featured a building designed like two giant donuts. The chain went out of business in 1979, and only the Donut Hole in La Puente still remains today. 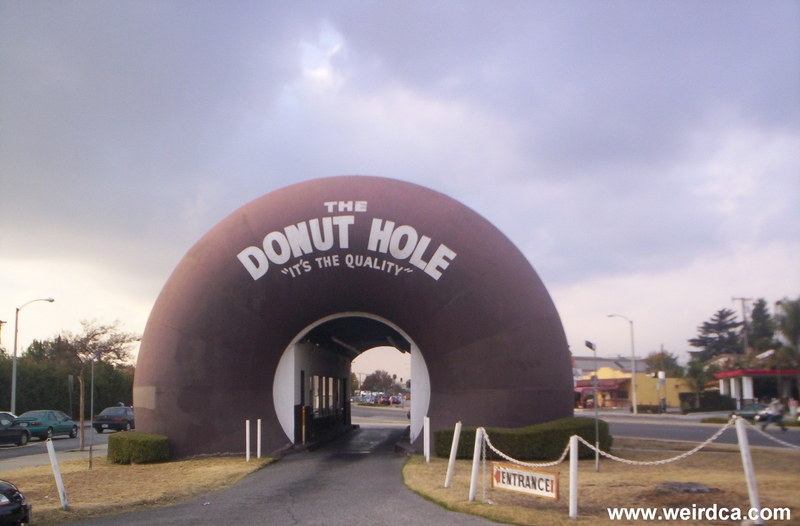 The Donut Hole is 40 feet high and made of fiberglass. 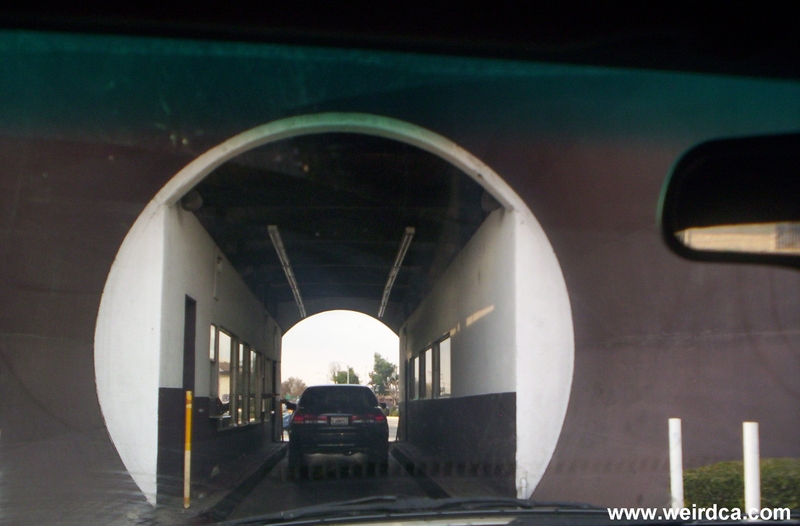 Customers drive through the hole of a giant chocolate donut into a tunnel with display windows filled with pastries and other goodies, and then after making your purchase, exit through yet another giant chocolate donut. The shop is open twenty four hours a day and is also a popular place for newly weds to drive through, supposedly granting the marriage good luck. 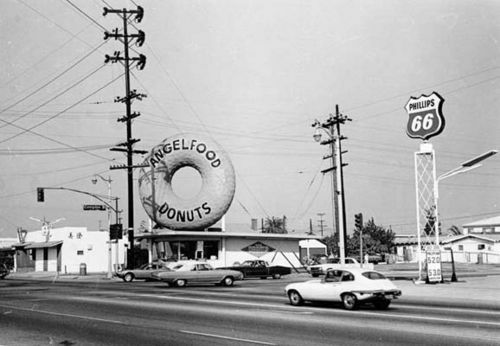 Long Beach back in the 1950s featured a separate doughnut chain called Mrs. Chapman's Angel Food Donuts Chain. It's rumored that there might have been as many as 21 of these locations in the franchise, although only a few once had giant donuts on their roofs. These large donuts are no where near as large as the former Big Donut Drive-In ones, and appear to be made out of metal duct work or metal hoops with material stretched over them. 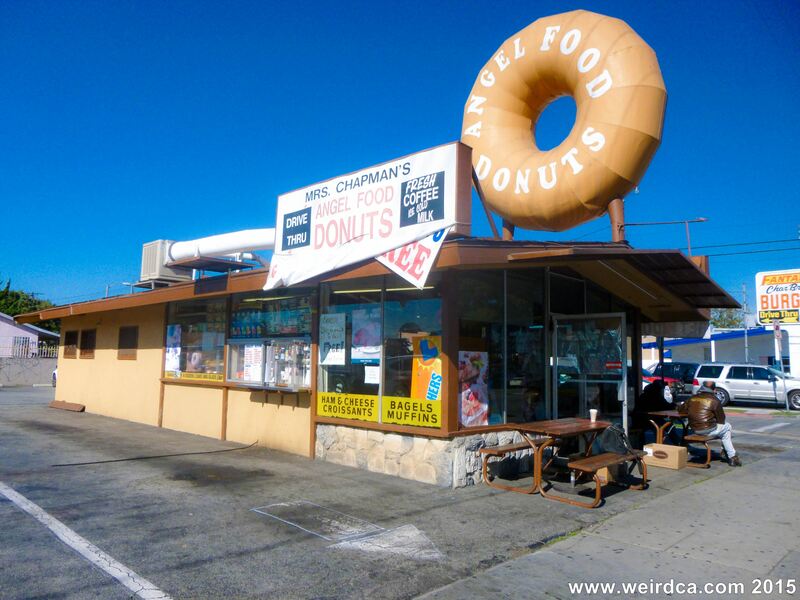 Although Mrs. Chapman's, the chain, is long gone, there are still at least four of these giant donuts remaining in Long Beach. Three of the four still even have "Angel Food Donuts" proudly written on them. One of these three is even still called by its original name, whereas a second is now called Angel Donuts and Pizza (formerly Billy Donuts). A fourth giant donut was, up until 2014 covered in pink frosting. It was at risk of being torn down ironically by Dunkin' Donuts who took over the location from the cafe, Daily Grind Espresso Bar. 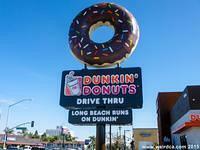 Until Dunkin' Donuts took it over, the location hadn't served a donut for over a decade. 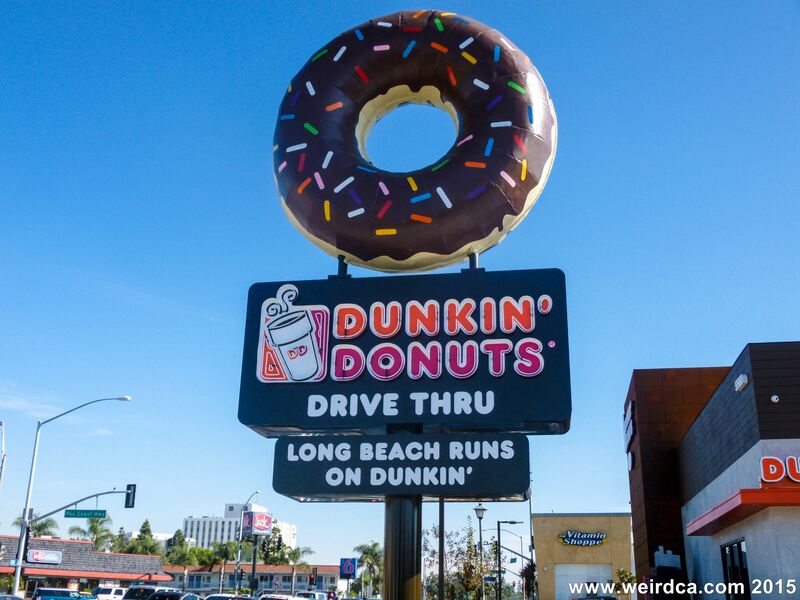 But after locals launched a "Save the Giant Donut" campaign, Dunkin' Donuts decided to refurbish the giant pastry and put it up before their new store. It returned in December 2014 with a new chocolate glaze and sprinkles, and the location is proudly serving up delicious donuts once again. From the picture to the right, it does appear, however, that at one point in time, an Angel Food Donut store existed inside a former Big Donut Drive In building. Where this former Big Donut Drive In / Angel Food Donut location was, I'm not sure. 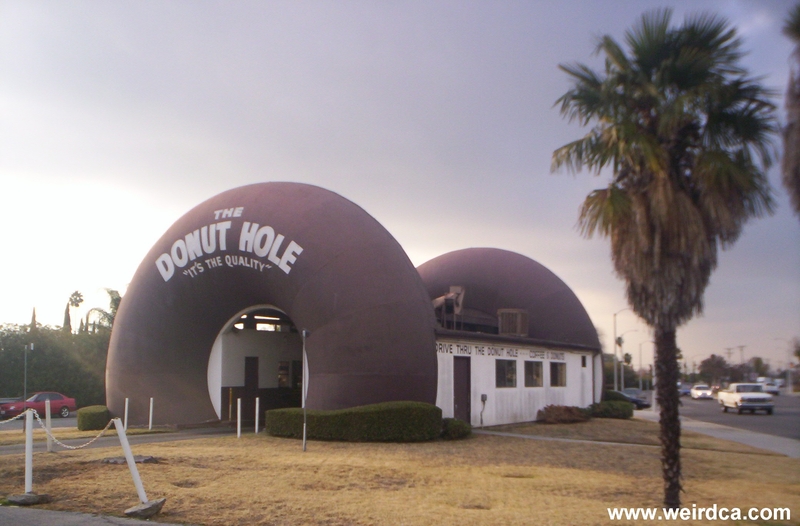 The Donut Hole and other giant donuts are a form of Programmatic Architecture that was common in Los Angeles several decades ago. 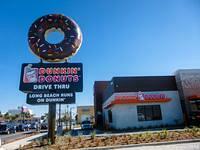 The Big Do-Nut that was once owned by Angel Food Donuts was the one on Western and Marine, now Donut King II. 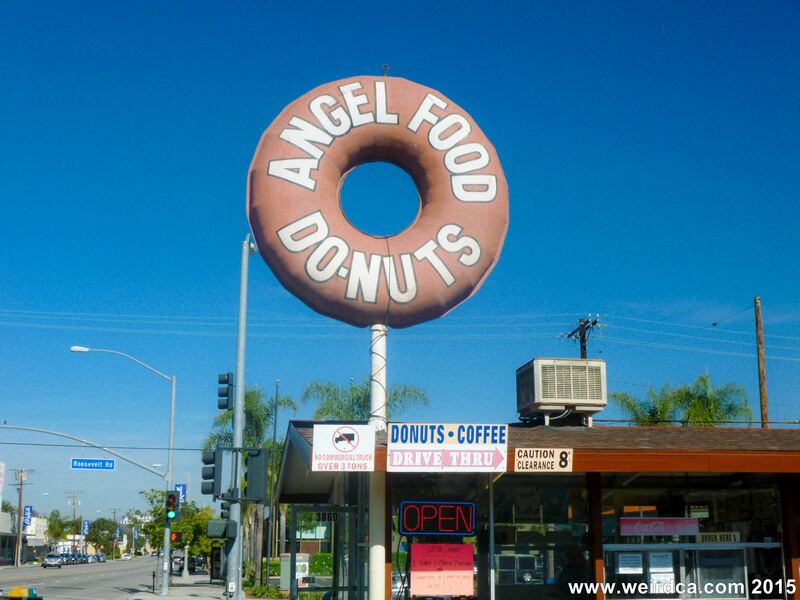 The Angel Food doughnut signs were created by George Soneff, owner of L & S Restaurant Supply on Rosecrans Blvd in Compton. They were made out of sheet metal in the L&S factory, which was behind the block-long showroom on Rosecrans.